While visiting Vienna in 2004, I came upon a graceful storefront with a large overhead bronze disk sign and a window display that was so inviting from the street: Galerie Slavik. The appealing architecture attracted my companions and me in, and we were rewarded with the gallery’s current exhibit, a collection of exquisite goblets by the Catalan artist Joaquim Capdevila. Renate Slavik, the gallery’s owner, was there. She showed us her gallery’s treasure of beautiful, impressive art jewelry pieces and spoke about the artists who created them. This encounter opened for me a whole new world of art, for which I will always be thankful. I am now delighted at the chance to interview Renate Slavik and her personal assistant Jutta Pietsch, who share their thoughts on Galerie Slavik’s history and mission, and its place in the wonderful world of art jewelry. Adriana G. Radulescu: Galerie Slavik celebrated its 20th anniversary in 2010. To mark this occasion, a beautiful book on Galerie Slavik, titled Art Meets Jewellery, was published by Arnoldsche Art Publishers. In the foreword of the book, Renate, you quote Georges Braque and embrace his words as a motto: “Let us not try to convince, let us begin to make people thoughtful.” As the gallery celebrates 27 years of existence in September 2017, can you go back and tell us how it all started? Renate Slavik: When the opportunity suddenly arose to take over the tenancy of the Himmelpfortgasse premises in downtown Vienna, I had already dealt in antiques for 20 years. I was attracted by the idea of exploring my own personal aims anew, so I made the decision to launch out into new waters—and the decision has proved immensely worthwhile. There had been a contemporary jewelry art scene in Austria since the late 1960s, promoted by Inge Asenbaum with her legendary Galerie am Graben, which continued to act as an important platform for the sector until the mid-1980s. As late as 1990, jewelry art was only well known in certain restricted circles, and one of the first challenges was to familiarize the public with the genre through information and education. It was at this time that I made the acquaintance of Hermann Jünger, who exerted an important influence on the younger generation with his class for jewelry and fine utensils at the Academy of Fine Arts in Munich. The exhibition of his and his daughter Ike’s work was showcased at Galerie Slavik in June 1997 and was to be one of the high points of the first decade. Even after 26 years, we’re still continually engaged in education work. Following the example of Braque, it’s not our primary goal to convince, but to inform. How is your adopted motto relevant to the beginning of the gallery and its development throughout the years? Renate Slavik: Quality and uniqueness are the principles that have guided me over the past 26 years in my work as a gallery owner. Especially in the art of jewelry this precious, special moment occurs, as I’ve frequently pointed out, when a person finds his or her “counterpart” in my gallery: the piece of jewelry which she or he wants to wear directly on his or her body or clothes because it reflects something in his or her innermost being, or radiates something, complements his or her personality, enriches her or him in an exciting way, or simply gives joy. Galerie Slavik commissioned brothers Tomas and Edmund Hoke for the architectural design of the gallery. Its transparency and the large rotating bronze disk that protrudes through the glass storefront into the street will impress those who visit the gallery. In fact, the design is so successful that Galerie Slavik has been included in the city’s architectural circuits, including the 1996 architectural guide Vienna: A Guide to Recent Architecture, which is no small feat in a town renowned for its timeless and innovative architecture. Please describe the gallery space concept and your collaboration with the architectural designers, and how the design works in conjunction with different exhibit installations. Renate Slavik and Jutta Pietsch: The artworks are displayed in floating glass cases suspended from a steel bearer, which in turn terminates into a rotating bronze disk above the entrance. The disk element is echoed in the design of the cases, which can be turned 90 degrees as required. Likewise, on the walls are sliding display cases. The fact that there’s no contact with the floor gives the whole space an intoxicating feeling of weightlessness. The universe of Galerie Slavik is mirrored by a fascinating interaction between its strict architecture and an aesthetic presentation of captivating objects. Twenty-six years after its creation, the design has proved its timelessness and continues to meet our needs perfectly. And the rotating disk, the signal or sign, has become a synonym for Renate’s life in the gallery. Time: Growth, movement, renewal. In any case, no stagnation. It has become our symbol—rotating continuously for 26 years and continuing to turn. Every exhibition is given its own individual design, which means that the cases are engaged in a constant play of positioning and repositioning. Your gallery has an impressive list of international artists, including iconic figures, well-recognized art jewelry designers, and emerging, innovative young artists. What was your first exhibit? How do you establish and maintain relationships with the artists that you’ve represented throughout the years? Renate Slavik and Jutta Pietsch: The first exhibition featured works by Elisabeth J. Defner, who at the time was one of Austria’s most important and best-known jewelry artists. She recently passed away, which is a sad loss to the art jewelry scene. Defner had a strong formative influence on developments in art jewelry, especially in the 1970s, and was active right up until she died. Through jewelry art we have connections across the whole world. First of all, we maintain regular personal contact with our artists. We invite them to be present at our exhibitions and we promote their work in a wide variety of ways. In the last 26 years, some have become close personal friends. Long-standing cooperation with our artists has resulted in a strong sense of emotional attachment and fellowship. We’re in contact with our artists as they go through their creative processes, supporting them by always having an ear for their concerns, including quite everyday problems. And we offer them a kind of network—a means of being in contact with other artists and engaging in fruitful exchange. What are the most important things you look for in an artist’s work? Renate Slavik and Jutta Pietsch: The most important things for us are artistic quality, creativity, and the level of technical execution, of craftsmanship. Every work must have something to say, must have a message. After all, that’s what distinguishes true art jewelry from mainstream commercial jewelry. The various techniques and different materials also play an important role, likewise the surfaces, the colors, and the question of whether the pieces lend themselves to being worn. While Stephan Hampala, for example, works with antique glass beads from Bohemia and Venice, Silke Trekel makes her creations in porcelain, and Gabriele Kutschera’s raw materials of choice are iron and precious metals. What’s exciting for us is to realize that, even after 25 years of intensive work with the art of jewelry, there are no limits in sight in regards to the individual evolution of our artists or their artistic expression. It’s important for us to give artists the feeling that they are entirely free to choose their own way. It’s a delight for us to have the privilege of observing them in this process. We also take note of where jewelry artists have received their training. Another factor is quite simply our own intuition. How would you describe in a few words your gallery collection? Renate Slavik: There are really only three things that all our artists have in common: quality, quality, and quality. 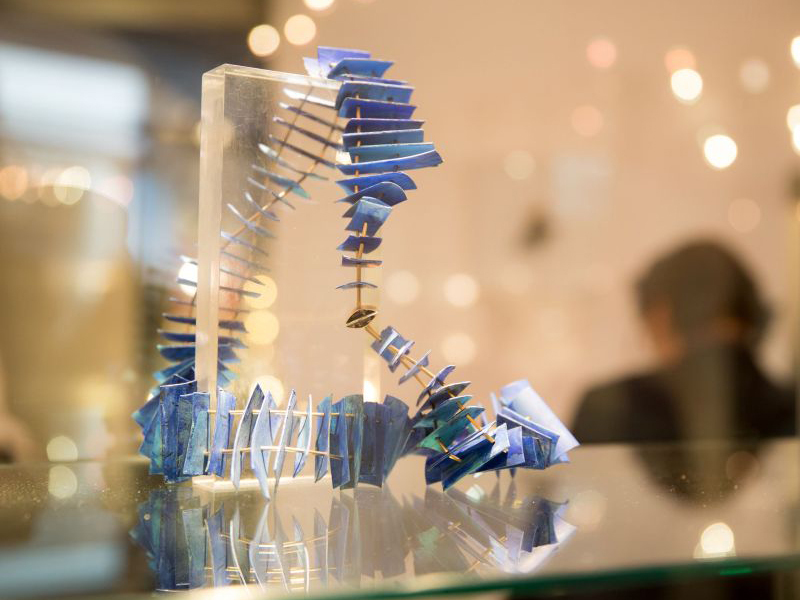 Along with exhibiting the works of established jewelry artists such as Annamaria Zanella, Jacqueline Ryan, Stefano Marchetti, Michael Becker, Helfried Kodré, Anna Heindl, and Gerti Machacek, we also represent eminent grand masters such as Bruno Martinazzi and Joaquim Capdevila. However, we’re equally committed to presenting young artists whose work we find convincing. As is clear from the multitude of styles and techniques that are represented at Galerie Slavik, artistic independence is particularly important to us, nothing is off limits. Galerie Slavik has several exhibitions each year, a combination of artists’ solos and group shows, including occasional exhibits of objects, ceramics, and textiles. What are your criteria for the shows? How do you curate them? Renate Slavik and Jutta Pietsch: As we collaborate with our artists on a long-term basis, the exhibition program takes shape two or three years in advance. Stefano Marchetti and Kazumi Nagano are already working on an exhibition scheduled for 2019. This means that our artists have to be patient and wait for considerable lengths of time, but it’s important to us to exhibit genuinely new work and to mount up-to-date exhibitions that break new ground. Our artists often create new and original work, especially for a forthcoming exhibition. In these cases, we visit them at their ateliers and discuss the themes and character of the exhibition in question. While we’re totally committed to jewelry art, we are also open to other fields of the decorative arts—for example, we’ve had exhibitions featuring the Catalan ceramic artist Madola. What advice would you give young artists starting their career? Renate Slavik: First and foremost, I recommend basic gold- and silversmith’s training, which in my opinion is the foundation for working as a jewelry artist. The next important thing is that artists remain true to themselves and not slip into the world of commercial jewelry—which in many cases implies financial sacrifices. I can tell you a story to illustrate this point. One day, a young German woman showed me some examples of her work. “Those will sell well,” she said, in a bid to arouse my interest. To which I responded, “These pieces are of no interest to me at all. What you must do is make the jewelry that you REALLY WANT to make.” A couple of months later she came back and I found her new work genuinely appealing—the jewelry was creative, had something to say, and was perfect in its craftsmanship. And my impressions were confirmed, as her works also appealed to our clientele and sold in no time at all. How do you promote the artists you represent and your shows to the public? Renate Slavik and Jutta Pietsch: All our artists are presented with their works on our new homepage, which also offers a snapshot of the development of art jewelry in recent decades. Every year we send our clients and a wide circle of jewelry enthusiasts our annual exhibition program in the form of a richly illustrated brochure. The art journal Parnass regularly publishes articles about our exhibitions, and events at the gallery are covered by the local daily papers here in Austria. In 2016, for Galerie Slavik’s special 25th anniversary, the gallery had an open discussion series called “Talking Jewellery,” a monthly event with represented artists. What was the concept behind the open discussions, and how did the public participate and respond? Is this a concept you’d used before? Will you continue it in the future? Renate Slavik and Jutta Pietsch: The “Talking Jewellery” events have been a great success. Many who attended have thanked us for the opportunity to deepen their knowledge of the artists involved and to immerse themselves in their creative world. For them it was clearly a very special experience. Some came to the discussions with pieces of jewelry art that they had bought many years before, which made it all the more interesting. We’re definitely continuing this particular activity. In November our special guest will be the jewelry artist and sculptor in metal Tomas Hoke. As previously mentioned, he and his brother designed our gallery. In the fall, Tomas will present new works in the annual Winter Journey exhibition. How would you describe your clients? Are they local? International? Do they consider themselves collectors? Renate Slavik and Jutta Pietsch: In the course of the last 26 years, we’ve built up a large circle of regular clients worldwide; we receive regular visits from faithful gallery devotees not only from all over Europe but also from the US, New Zealand, Asia, and Russia. One comment they constantly make is that we’re not just a jewelry gallery but also a jewelry museum in Vienna. Generally speaking, most of them are simply jewelry lovers, though we also receive visits from a number of genuine collectors. The gallery’s clients, along with artists, architects, and museum curators from all over the world, value the gallery as an inspiring platform and idea pool. Seeing so many people making their first enthusiastic ventures into the world of art jewelry is a great source of happiness for us. What are the joys and challenges of running the gallery? Renate Slavik and Jutta Pietsch: The fact that we share in our artists’ passion and enthusiasm gives us the strength and energy to rise to the challenges of our work, which we consider to be a real vocation! The greatest challenge remains that of communicating the intentions of our artists. We’re constantly involved in providing our clientele with information and explanatory descriptions of marvelous works of jewelry art. But we’re also rewarded with rapturous emails from delighted customers telling us how much they love the artworks they acquired and what happy memories they have of their visit to Galerie Slavik. Our international fan mail grows and grows. I read that Renate has visited art colleges and art universities, many of which have teachers whom the gallery represents. What does this experience bring to you as a gallerist and an art jewelry advocate? Renate Slavik: On these visits I find myself confronted with a wide range of artistic paths and worlds. Time and time again I find it a profoundly satisfying experience to open myself up to the huge spectrum of jewelry on offer. Discussions with teaching staff and students alike extend my art jewelry horizons. The variety is extraordinarily inspiring and I get a tangible feeling of how the students are developing and constantly breaking new ground. Renate, in 2002 you founded the Galerie Slavik Grassi Prize, which is awarded for jewelry art at Grassimesse, the annual decorative fair at Leipzig’s Grassi Museum of Applied Arts. What inspired you to create this award, and what does it mean to you? Renate Slavik: For years now it has been a particular priority for me to support young jewelry artists. My activity as a member of the selection committee makes me happy despite the choices that one has to make, because I enjoy offering young artists a springboard for their careers. Today this is more important than ever. In 2002, Galerie Slavik’s first Grassi Prize was awarded to Margit Jäschke. It’s been a great joy to follow her artistic development. For 2017 I was asked to be a member of the Committee of the Danner Foundation. I accepted with a lot of joy. How do you see Galerie Slavik’s role in the art jewelry community now and in the future? Renate Slavik and Jutta Pietsch: Thanks to its pursuit of the very highest quality and its specialization in non-serial jewelry art, Galerie Slavik has earned a place all its own on the international contemporary jewelry scene. We believe in the quality of our artists, which we nurture through the gallery’s activities, and we’re convinced that jewelry art has a secure and bright future. Are there such things as “trends” or “fashions” in art jewelry? Renate Slavik: The developments in our field do not follow “trends” of the kind evident in the fashion or commercial world, which simply don’t exist in jewelry art. None of the great masters, the really epoch-making jewelry artists such as Bruno Martinazzi and others, paid any attention to trends or fashions at all. The important thing for a jewelry artist is to follow his or her own unique path. However, this is not to deny the importance of being in touch with what’s going on in the world and the effect the times are having on art—the feelings aroused, the protests being made, what aspects of the world artists are reflecting, what ideas art is expressing. Signs of the times often send out far-reaching ripples. Suddenly there’s a widespread focus on a certain phenomenon or idea, which is then taken up and dealt with by many artists, but in a wide variety of different ways. What are you currently reading, hearing, or seeing of particular interest to you that you can share with our readers? Renate Slavik and Jutta Pietsch: For us, an important supporting role is being played by Arnoldsche Art Publishers, which acts as a sound and solid information source for what is happening on the contemporary art jewelry scene. We have the greatest admiration for Dirk Allgaier’s commitment as a publisher. For several years now, he has had great success with Arnoldsche, following his own chosen path of publishing for the decorative arts. Arnoldsche publications on jewelry art are produced and designed with great passion and aesthetic sensitivity and are an asset to us all. Among the numerous books on specific artists are HIMMLISCH, Sonne, Mond und Sterne im Schmuck (HEAVENLY: Sun, Moon and Stars in Jewelry), by Fritz Falk, and the catalog of Munich’s Neue Sammlung – The Design Museum devoted to Tone Vigeland. Arnoldsche also produced our jubilee publication, Art Meets Jewellery: 20 Years of Galerie Slavik Vienna. Editor’s note: You can read a review of Art Meets Jewellery, written by Jennifer Cross-Gans, on AJF at this link. Adriana G. Radulescu is an architect and jeweler living in Washington, DC. She has a master’s degree in architecture and urban design from Ion Mincu University of Architecture and Urbanism in Bucharest, Romania, and metalsmith training from the Corcoran School of the Arts and Design in Washington DC. She joined AJF in 2013.